Ithaca Murals is an organization of people transforming gray walls into beautiful meaningful works of art that tell the stories of the diverse people who live here and what we care about. We implement a cultural arts strategy for decolonizing public space and for achieving justice for every single person in our community. We have this inclusion model because we recognize the well being of all people is important. In this way, we welcome everyone to be involved in Ithaca Murals while simultaneously prioritizing the leadership of artists of color, artists with jail experience, low income & working class artists, women, the ITQBLG community, youth, and other artists of traditionally marginalized identity groups in order to challenge Eurocentric patriarchal capitalism. What would you like our cityscape to look like? ​This is an artist takeover. Watch out. If you're lucky, your house could be next. In 2004, I met Ithaca community elder Gino Bush just as he was beginning the work of making true an idea of IHS students to rename an Ithaca street after Martin Luther King Jr. At that time, Ithaca's cultural landscape was dominated by streets, parks, and buildings named for (and by) white men. We campaigned together (with many others too) for the Board of Public Works at City Hall to change State St.’s name. After 4.5 years, State St. is now dual designated Martin Luther King Jr St. as a daily reminder to passersby of King’s life committed to justice. Gino Bush's cityscape strategy inspired me to use my passion for art to organize murals. In 2008, I joined the City of Ithaca Public Art Commission. Soon after, I spearheaded a mural contest which resulted in the Underground Railroad Mural on Green St right near the Ithaca Commons. This project was so successful, that the Board of Public Works gave the Public Art Commission their blessing to work with City Hall’s Planning Department and elected officials to bring many more murals to City infrastructure. 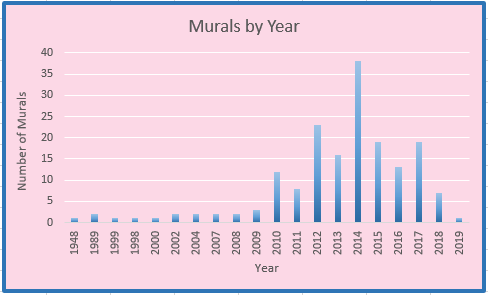 Over the last nine years, (thanks to many artists and organizers) we’ve had an amazing surge in the number of murals on both public and privately owned walls. In 2009 there were about 15 mural locations in Ithaca. Today in there are over 150 and the numbers are continuing to snowball. At worst, public art is a tool for gentrifying neighborhoods, but at best is a means for participatory democracy where people from all walks of life have opportunity to influence what our community looks like. Mural making isn't just about an end product, but a long team building process to create each meaningful piece of art. Haudenosaunee, Latinx, African American, Muslim, and other many other cultural pieces now adorn our cityscape. Come join the fun!